Fr. Mark Massa, S.J. was the speaker last night at NDS' annual Msgr. Tekippe Theological Forum. His lecture was titled, "A Pox on Both Your Houses: Moving Beyond Conservative and Liberal Labels in the Church." Fr. Massa argued that the use of secular political labels to describe ideological parties within the Church is not only historically and theologically inaccurate, it's destructive as well. He pointed out that using labels like "progressive," "traditionalist," etc. to denote one's posture toward change in the Church suggests that change is somehow an option for us, something that we can legislate or avoid. He surveyed the use of partisan labels in our history, noting that only in our very recent history have we adopted secular labels to denote ideological differences. Part of the reason for this adoption of secular partisan labels has to do with the introduction and development of historical consciousness in late 19th and early 20th century theology (esp in Biblical scholarship). Though historical consciousness helped the Church to better understand how our faith has responded over time to various cultural-political challenges, its introduction into ecclesial life wasn't pretty. The modernist crisis in the European Church after the French Revolution was largely the result of the historical consciousness of change crashing into an institution unprepared for its challenge. Our current ecclesial polarization results from the Church "putting off" dealing with the inevitability of change. VC2 gives us the tools for recognizing and managing ecclesial change; however, because we put off dealing with the inevitability of change for so long, what could have been a renewal post VC2 became a revolution instead. Generally, I agree with Fr. Massa's view. It seems to me that change is inevitable and that a historical consciousness of how we respond to various challenges both inside and outside the Church is here to stay. 1). Though he didn't argue the point directly, it would seem reasonable to suggest that using secular partisan labels also places our anxieties about immediate change at the center of the Gospel rather than seeing these worries as peripheral to Christ's charge to go out and preach. In other words, as a Church, we risk damaging the Gospel message in this century by failing to think in centuries as the Church always has. The use of secular partisan labels stunts our ability to think in centuries. 2). Whereas historical consciousness is primarily a way of describing changes in the Church, it came to serve as an argument for prescribing particular changes. In other words, that the Church changes to meet various secular challenges has become an argument that the Church ought to change to meet various secular demands. This strikes me as a non sequitur. So, I wonder if those in the Church who advocate for particular changes using historical consciousness as their warrant recognize this is/ought fallacy as a fallacy? “If you live today, you breath in nihilism. In or out of the Church, it's the gas you breathe” (F. O'Connor, The Habits of Being, 1955). As the pervasive mood of postmodern culture, we might say that nihilism is less a breathable gas than it is a poisonous cloud. It erodes our already imperfect grasp on knowable truths; dissolves the bond between the goodness of being and our moral acts; and vandalizes our faithful efforts to understand the ordered beauty of God's Self-revelation in created things. Whether nihilism is taken to be a method of thinking about the world or a consumerist lifestyle-choice, its influence on the human person is pernicious. How does the Catholic preacher account for this influence? How do we preach the Good News to a culture that has come to understand the human person as nothing more than a thinking animal destined for annihilation after death? This seminar will survey the literary, historical, philosophical, and theological origins/development of nihilism in western postmodern culture and explore strategies for responding to its cultural influence in our parochial preaching. We will read texts from Nietzsche, Heidegger, Vattimo, R. M. Rilke, Flannery O'Connor, Cormac McCarthy, the Death of God theologians, and J-L Marion. Students will write one seminar paper (10-12 pgs.) and two Sunday homilies. Prerequisites: HP 504, 505. Limited to 8-10 students. Among the books and articles I'm reading to prepare for the Advanced Preaching Seminar at NDS this spring is an excellent book by Phil Snider, titled, Preaching After God. The first two chapters of this book lay out what Snider calls "the modern homiletical crisis." Basically, he argues that the liberal/progressive theology of modernist Christianity has left progressive ministers and preachers with little to say about God. He charts the development of modernist theology through several philosophical veins, including the usual suspects: Kant, Hegel, Fichte, and, of course, Schleiermacher. Despite his embrace of progressive theology, Snider laments the "death of God" in liberal Protestant preaching, noting that preaching in the mainline churches has become little more than politically tinged ethical exhortation. He writes, "Activism became the rule of the day in modern preaching largely because God was not longer identified as anything other than a projection of the best intentions and ideals of the human spirit, if anything at all, and religion was reduced to activism. . .When one considers the import of Kant and Hegel on liberal theology, it's no coincidence that sermons that fall prey to the modern homiletical crisis (1) place primary emphasis on a Christianity that is boiled down to ethics. . .and (2) lose sight of the infinite qualitative distinction between God (the wholly other) and human beings. When God is just a manifestation or extension of our best selves on our best days, when there is no infinite qualitative distinction between human beings and the 'wholly other,' then God is, for all practical purposes, dead" (66). To any Catholic who's been paying attention to parochial preaching in the last 40 yrs. this diagnosis of liberal Protestant preaching should sound eerily familiar. Having misinterpreted and misapplied the Second Vatican Council's invitation to engage modern culture in dialogue, ecclesial elites have so domesticated the Divine that it is almost impossible for them now to understand the Church as anything other than a social service agency. The task of Catholic homiletics in the 21st century is to explore ways of returning a sense of the "infinite qualitative distinction" btw Creator and creature to our preaching w/o portraying God as inaccessible. Part of this project then will be to re-establish the event of the Incarnation as a central theme of Catholic preaching. * Snider sees some hope for progressives in deconstructionism. My sense is that this is a dead-end for Catholic preaching as a solution. There may be uses for deconstruction as a heuristic but ultimately Catholic preaching cannot jettison metaphysics. "If they are going to follow Christ in today’s environment something more rigorous is needed. 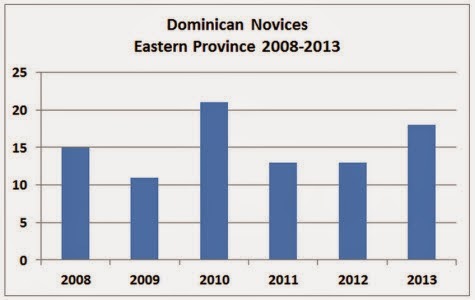 . ."
Very enlightening interview with the Eastern Province Dominicans* about their phenomenal growth in vocations. . .
One fact I didn't know and kinda shocked me: "Right now our Province has 70 men in formation for the priesthood and cooperator brotherhood." Seventy?!?! Wow. "70 men in formation" means that the EDP has a total of seventy men in the novitiate and studium, i.e. novices and seminarians. Oh, and they have charts too! * Oddly, the friar giving the interview isn't identified, though I'd bet it's Fr. Benedict Croell, OP, vocations promoter for the EDP. One week ago today at 5.50am, I was driving down the Carrollton Ave exit off I-10 when I felt a weird sensation from the brake pedal. . .sort of like a pause in the braking-grip. Just as I was noticing this weirdness, the Check Engine light on my dash lit up. After suppressing a spike of panic, I waited for the engine to erupt in flames, or to simply fall out of the bottom of the car and leave me pedaling the Toyota a la Fred Flintstone. . .
No explosion. No wrenching crash of metal. When I got to my office, there was an email waiting for me from the place where I get a three-month oil change. Ah, I thought, The Car is in cahoots with the Oil Man. Easy fix. Regardless, I spent the rest of that day dreading the drive back to the priory. Being a good postmodern-sort, I googled, "Check Engine light" and discovered that this phenomenon could indicate anything from a sticky fan belt to a diseased transmission. Great. My history with car repair is a long, sad tale, involving thousands of dollars, weeks of anxiety, and lots of begging for rides. Saturday: got the oil changed. "Check Engine" still shined brightly from the dash. Monday: off to see Mr. Ray at Fleur de Lis Auto Care. I spent the morning in my room dreading the call from Mr. Ray. In my head, the news went like this: "Father, your transmission is attached to the engine with a bent paper-clip and the axles are held together with chop-sticks and duct tape." Me: "Great. I'll bring over a new box of paper-clips and a roll of duct tape!" When the call came. . .I jumped. Mr. Ray: "Father, we put the scanner on your car. . .[thundering drum roll]. . .the gas cap was loose." So. All it cost me was a little humiliation and a lesson in Gas Cap Tightening Procedures. And they did it all w/o any GOP "obstructionism"! ". . .the Golden State now suffers the highest level of poverty in the country—23.5 percent compared to 16 percent nationally—worse than long-term hard luck cases like Mississippi. It is also now home to roughly one-third of the nation’s welfare recipients, almost three times its proportion of the nation’s population." In a homily delivered in Assisi, Italy on the feast of St. Francis, the Holy Father asks, “Where did [St.] Francis’s journey to Christ begin?” His answer to this question is frightening. His answer shows us why Paul must encourage Timothy: “God did not give us a spirit of cowardice.” And why the apostles beg the Lord: “Increase our faith.” His answer even shines light on why the prophet Habakkuk wails at God: “How long, O Lord?. . .Why do you let me see ruin; why must I look at misery?” Where did St. Francis begin his journey to Christ? The Holy Father answers: “It began with the gaze of the crucified Jesus. With letting Jesus look at us at the very moment that he gives his life for us and draws us to himself.” To look and see such misery and knowing all the while that Christ's ruin is our repair. . .no one possessed by the spirit of cowardice could watch this. No one lacking in faith would be pulled into his gaze from the cross. Accepting and living the Good News of Jesus Christ is one life-long act of courage, one small act of faith after another. But neither Christian courage nor faith in God deserves applause or gratitude. Why? B/c we are drawn to Christ. . .by Christ. Our Holy Father says that our journey to Christ begins “with letting [the crucified] Jesus look at us at the very moment that he gives his life for us and draws us to himself.” What does he mean by “letting Jesus look at us”? No one needs my permission to look at me. They just look at me and here I am, being looked at. All of us are seen everyday without even knowing it. We look at others all the time w/o their permission. But couldn't we say that the difference btw Looking and Seeing is the same as the difference btw Hearing and Listening? What's that difference? Attentiveness, intention? I can hear but do not listen; I can look but do not see. Does this sound familiar? Jesus teaches his students that they will meet people along the Way who hear and look but do not listen or see. These people will hear with mistrustful ears and look through cowardly eyes. Attentiveness and intention make a difference, of course, but the difference that makes The Difference is faith. Jesus doesn't just look at us from the cross; he gazes at us. He looks with intent, with purpose, and if we let him gaze at us, we return his gaze in kind. We are drawn to him and our looking becomes seeing with faith. Notice why the apostles suddenly beg the Lord to increase their faith. They ask him how many times they should forgive a brother who sins. Jesus says, “. . .if he wrongs you seven times in one day and returns to you seven times saying, ‘I am sorry,’ you should forgive him.” The apostles immediately see the connection btw forgiveness and faith, and they immediately recognize the weakness of their faith. To forgive someone who sins against you over and over again requires a great deal of confidence in the power of mercy to correct error. It also requires a strong sense of one's own sinfulness. But the purpose of forgiving others is to draw us back to the Cross and the merciful, dying gaze of Christ, the one who makes all forgiveness possible. When you forgive someone who sins against you, you bring the merciful gaze of Christ to them. You become Christ for them in that moment. That takes courage. It takes courage and a deep trust in the fact that not only are their sins forgiven but so are yours. The apostles know this, so they beg Jesus to increase their faith, to add to their ability to trust. Unfortunately, the apostles don't yet quite grasp how faith works. They still see faith as a quantity, a measurable amount of something that can be increased or decreased. Jesus, as usual, reveals the truth. He says, “If you have faith the size of a mustard seed, you would say to this mulberry tree, 'Be uprooted and planted in the sea,’ and it would obey you.” Faith isn't measured in quantities; it's measured in acts of courage and obedience. As the good habit of trusting in God's loving-care, faith—even the size of a mustard seed—can accomplish the seemingly impossible. If this seems improbable, then consider the strength it would take to forgive someone who sinned against you seven times, or seventy-seven times. That's not a feat of brute physical strength but rather a feat of spiritual strength. What does it say about you and your relationship with God that you can show mercy to a person who's hurt you seventy-seven times? It says that you are painfully aware of your own sinfulness and your own need for mercy. That you can forgive them—even just once—is an act of courage, an act done in fear despite that fear. If you trust that Christ died on the Cross for you and even now draws you into a life of holiness with his dying, merciful gaze, then that trust must be shared, given out. We cannot follow Christ unless we are ready to become Christ. And that kind of trust can be large or small so long as it is also strong. You might be thinking right now: I'm not THAT strong. Lord, give me strength! Excellent prayer. Paul writes to Timothy, “For God did not give us a spirit of cowardice. . .So do not be ashamed of your testimony to our Lord. . .but bear your share of hardship for the gospel with the strength that comes from God.” The spirit that God gives us is His Holy Spirit, the spirit of love. When we call upon the strength we need to endure and thrive, we are not calling upon any created power, any merely human reserve of energy or vigor. We call upon the gift of God Himself, the freely given presence of Love Who is God. Like faith and hope, this love is bound to us in our human nature; that is, wired into each of us from the moment of our conception. There is never a question of whether or not we “have faith” or whether or not we “have love.” We do, by nature. The question is whether or not we will use God's gift of freedom to love freely, forgive extravagantly, and bear witness to His mercy! Any and every strength we have is from God, but it is only with our cooperation, our permission that faith, love, and hope mature. IOW, we allow the crucified Jesus to see us. And we look back at him, seeing, trusting.